Shift 2.2 launched last night with support for ten new web apps, two more extensions (full list below), and a whole smorgasbord of product enhancements and feature updates. It’s absolutely fanSaaStic…if we do say so ourselves. To upgrade, simply log in to Shift and you will be prompted to relaunch with 2.2. All new features and updates will be accessible after you do that. Performance enhancements (we are speedier than ever). 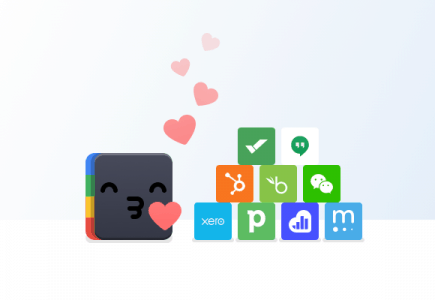 Hubspot– enterprise clients, this one is for you! Xero– number wizards everywhere are rejoicing. WeChat– get social with Shift! Bamboo HR– a personal favorite here at Shift. Kissmetrics– grow that customer base! Mixpanel– take a deep dive into user engagement. Hootsuite– a social media manager’s dream! Pipedrive– managing sales efforts, right in Shift. Wrike– stay on task and up-to-date. You asked for it, so we’ve added support for Dropbox for Gmail and Zoom. These are available with our Advanced plan. Stay on task and on top of your to-do list with new notification badges for Asana, Trello and Facebook Messenger. It’s time to get social with Shift! For all the technical ins-and-outs, please check out our Knowledge Base article!